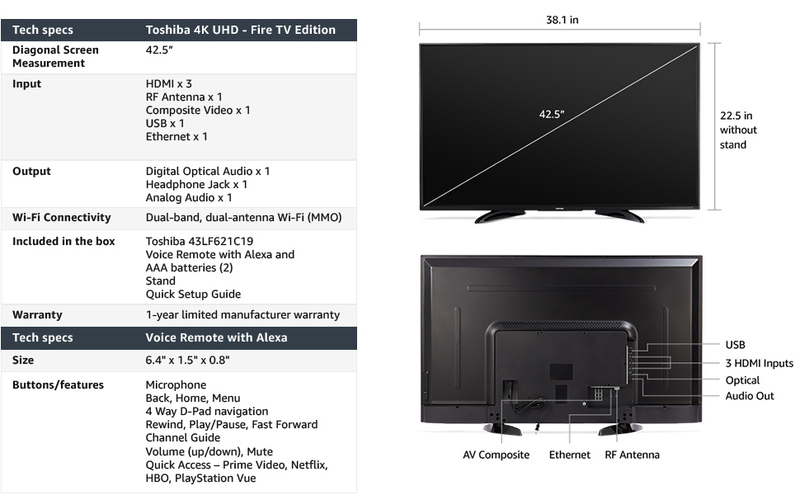 Toshiba 4K UHD Smart TV is a new generation of television featuring the Fire TV experience built-in and including a Voice Remote with Alexa. With true-to-life 4K Ultra HD picture quality and access to all the movies and TV shows you love, Toshiba delivers a superior TV experience that gets smarter everyday. The Voice Remote with Alexa lets you do everything you’d expect from a remote—plus, easily launch apps, search for titles, play music, switch inputs, control smart home devices, and more, using your voice. Experience breathtaking 4K Ultra HD picture quality with more than 8 million pixels for stunning clarity, deep contrast, and vivid colors. Watch movies and TV shows come to life in Ultra HD. Toshiba is built for speed and performance. It’s powered by a-quad-core CPU/Multi-core GPU for instant search results and fast and fluid responsiveness. Connect easily with dual-band Wi-Fi, three HDMI inputs, and multiple input/output options. You can even customize the name of each input and adjust picture settings for each connected device. 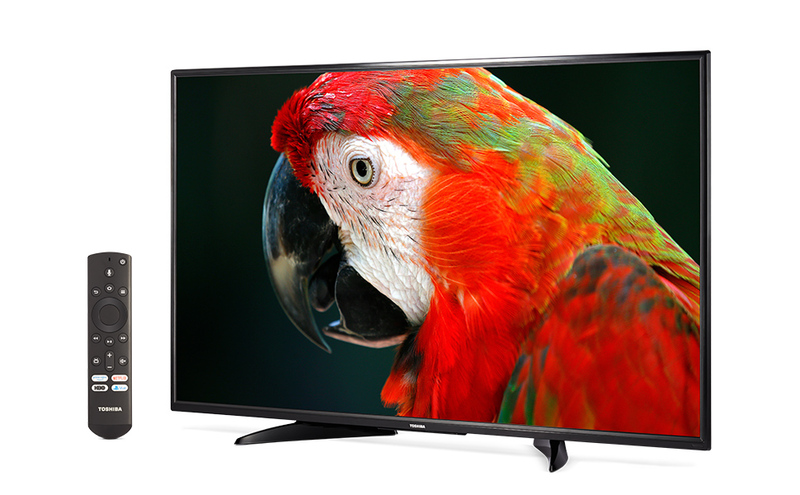 This TV is HDR-compatible, so you can enjoy HDR movies and TV shows. Plus, your TV keeps getting smarter with new Alexa skills and automatic over-the-air software updates, so you always have the latest. 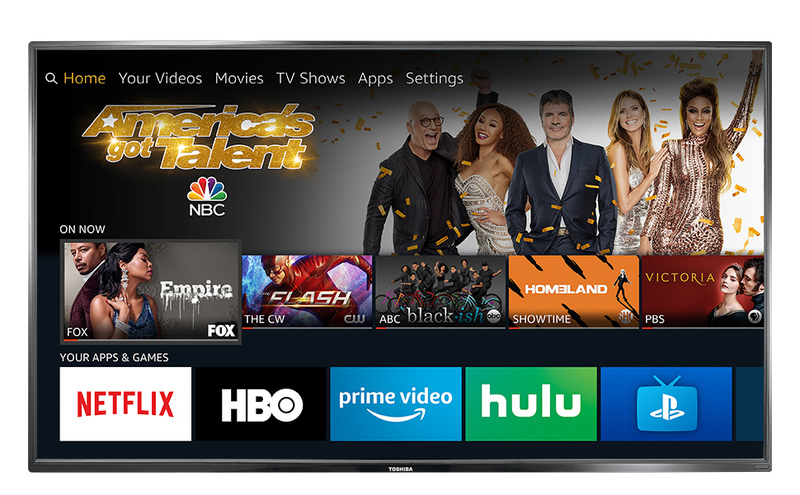 Fire TV Edition brings together live over-the-air TV and all your streaming channels on the home screen. Connect any HD antenna and use Alexa to instantly search for and watch live over-the-air TV, or choose from a vast catalog of streaming movies and TV shows from Netflix, Prime Video, Hulu, HBO, and more. Plus, you can subscribe to PlayStation Vue, Sling TV, DIRECTV NOW, and others to stream even more of your favorite live TV shows. You can also connect your cable/satellite box or gaming console through one of the TV’s three HDMI ports.